Will Facebook Ads even work for me as a real estate agent? It’s understandable you would ask that question - especially when it seems like you need a secret key to crack some kind of code to succeed with Facebook Ads as a real estate agent. At least, that is what the Facebook marketing gurus and agencies will tell you. Real estate agents taking the Facebook Ads Certification course, however, are finding that there’s nothing farther from the truth. With a small investment of time and the training we provide, you can immediately start generating and qualifying leads (motivated sellers and buyers), converting leads to clients and closing more transactions using Facebook Ads. And you can do this at a small fraction of the amount you pay now for unqualified leads from other sources. And what real estate agents love about our Facebook Ad course is that it doesn’t just teach...it shows. You’ll look right over real estate agent and online marketing expert Evans Putman’s shoulder like you are standing in the room watching his computer screen as he not only gives you a tutorial on Facebook Ads, but actually creates ad strategies and Facebook ads you can use right now to make more money in real estate. You, your ISA or virtual assistant can copy his ad campaigns and ads exactly substituting in your own information. It really is that easy. With our course, if you can watch a computer screen, you can succeed at Facebook Ads! Now, if you love cold calling, door knocking and driving around looking for FSBO signs for hours on end, paying too much for crappy leads, or overpaying an agency to deliver below sea-level ROI for your ad spend, then this course is not for you. 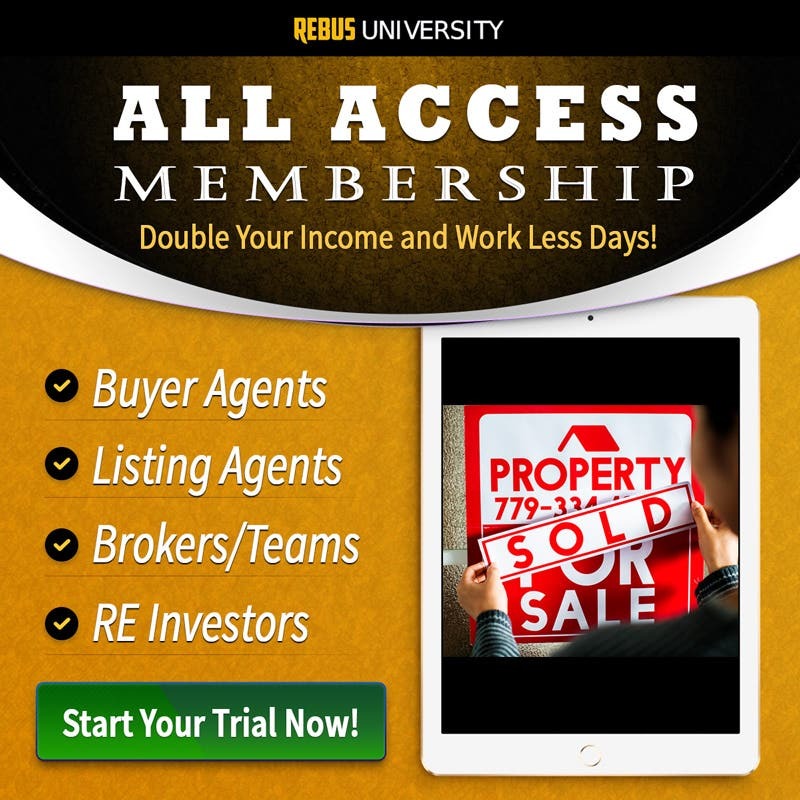 But...if you want to join the smart, successful agents seeing high ROI on ad spends, low cost per acquisition on highly-qualified seller and buyer leads and who turning on an automated funnel that delivers more transactions each month, then now is the time to act and invest in your success with Facebook Ad Certification from Rebus University. Buy Now with Complete Confidence...Facebook Ad Certification Comes with Our No-Risk 30-Day 100% Money Back Guarantee! SAVE BIG - Buy Now for Only $497! In this course, Evans Putman and Pat Hiban will not only teach, but show you exactly how to use Facebook Ads to get more qualified leads, listings, clients and sales even if you have no experience or have seen abysmal results with Facebook Ads before. ...but you watch, right over marketing expert Evans Putman’s shoulder on his computer screen, as he takes you inside Facebook Ad Manager and shows you exactly, step-by-step how to create High-ROI Facebook Ad Campaign Strategies from beginning to end (see list of strategies in the Course Curriculum below). You, your ISA or even a virtual assistant can follow along and recreate the exact ad campaign (even the Facebook Ad itself) Evans creates and immediately get started generating leads and closing more transactions! Below is a sample of what is covered in the course. How to leverage Facebook Ads the right way to lower your lead generation costs, skyrocket your ROI and generate more business than your competition. The listing agent’s secret weapon which helps you close more listing appointments, sell more listings and positions you as the go-to listing agent in your market. Quick and easy steps for writing Facebook Ad copy and creating images and videos that convert at high levels. How to use retargeting and custom audiences to maximize ad spend ROI, lower lead acquisition costs, and further qualify buyer and seller leads which helps you close more clients and transactions. A proven process for creating a high-converting 4-step social sales funnel and the secrets for laser targeting the perfect leads to fill that funnel. High ROI ad strategies for getting motivated sellers to contact you to list their home for sale, engaging your SOI to give you more referrals, qualifying buyer leads for your available inventory, farming neighborhoods for high-value leads, holding open houses that deliver big results, and more. Exactly how to set up an ad from beginning to end including campaign objectives, audience targeting, ad creation, Facebook pixels, ad testing and more by watching over Evans’ shoulder as he walks you through every step in high-quality screencast videos. And there’s even more...yes, you will learn all you need to dominate your local market and competition using Facebook Ads without needing to outsource your ad spend to a high-priced marketing guru or agency. Get Started today with no-risk whatsoever! Check out all the FAC offers for 30 days and if you don’t find it packed with value, then contact me and I’ll refund 100% of your money - no questions asked! The Facebook Ad Certification was Fun! I enjoyed the Facebook Ad Certification course very much. The information was very thorough and the step-by-step instructional videos were easy to follow. Oh, and there are a few bonus downloads at the end of the course. One of them is "The Ultimate Facebook Ad Cheat Sheet for More Real Estate Commissions." Definitely take this course! I just finished this course, and I was amazed to see how many ways Facebook can help me increase my real estate business! This course walks you through step by step how to create a Facebook ad and use it to increase your exposure, lead capture, and ultimately, your income. No doubt I will be re watching some of these videos as I get more and more familiar with the Facebook ad process. Thanks, Pat! This is the 1st Rebus University Course that I've completed. I really got a lot out of it & can't wait to start implementing the techniques in my marketing campaign. Thank you for making the course available. I liked that it was broken into short sections & was very easy to see & understand. Looking forward to taking more courses! Wow, I can't wait to put all this information into my facebook ads! Excellent detailed information! Everyone needs this, why are you waiting. Better and cheaper than Realtor & Zillow.com. This course was fantastic. It digs deep into the capabilities that Facebook's Ad Manager has, and does a great job of explaining how those features can be used to support your real estate business. It was eye opening for me, as a seasoned Facebook user, to become aware of the targeting potential that the Ad Manager has. I think a lot of folks in this industry are primarily using Facebook to brand their business, and branding has great value. But, if you're interested in using Facebook for lead generation and to target specific audiences with your listings, OC, etc., this course will be an outstanding tool for you to use. I have been creating and managing FB business pages for several years and learned multiple new skills during each section of the course. Overall, well done! Highly recommend. This had the exact amount of details that I was looking for. Evans and Pat shed light on a lot of components that I needed to know how my selections would strengthen or weaken my end product. I hope you offer a twitter or Instagram course in the future. Thank you, and I cannot wait to track the results from implementing what I learned.